I do apologise, I haven’t done much sewing lately. One reason is that I’ve not long come back from a ten day trip to Barcelona. Now ten days might sound like a long time to stay in a city that is often a destination for hen and stag weekends but the hubby and I like to immerse ourselves in a place. Last year we had ten days in Florence. Florence is much smaller than Barcelona and we just about managed that. And I knew I’d cope better in Barcelona as its on the coast. I just can’t be far from the sea anymore, I get a bit weird if I am! We had a fabulous time and totally immersed ourselves, eating where the Spanish ate drinking where the Spanish drank and walking where the Spanish walked. Could really tell the difference when we wandered into the more touristy areas. Which on occasion we had to do. We rented an apartment this time, and what a fabulous idea. So much better having the freedom to come and go as you please, stock the fridge with whatever you want, but best of all not having to get up really early in order to make it to breakfast before ten o’clock. As my husband has discovered after 24 years together, I like a slow start to my mornings. I have to get up very early when I’m working so on days off I like to take my time. I digress, what I was meaning to say before going off on a tangent was that the apartment was in a very busy side street with lots of locals living around us and going about their day to day activities. which means quite a lot of late night noise too. But it was great as we really felt like we got to see some Spanish life. 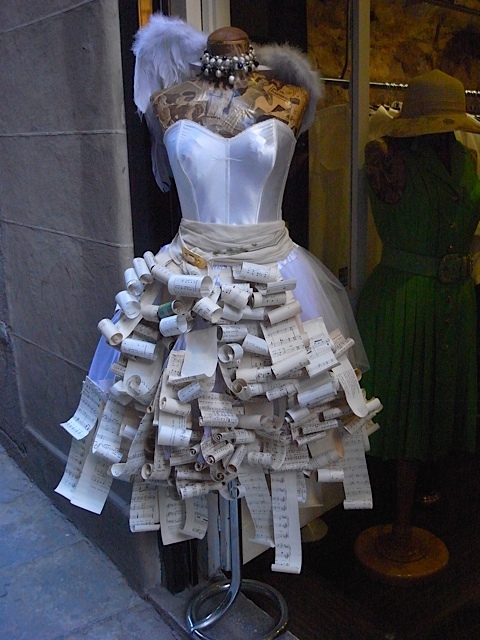 As this is a sewing blog I will tie some sewing in to this story. I have now made ten lovely short sleeved tops and I was very happy and proud to take all of them with me. Made packing so much easier as I knew what I was taking. 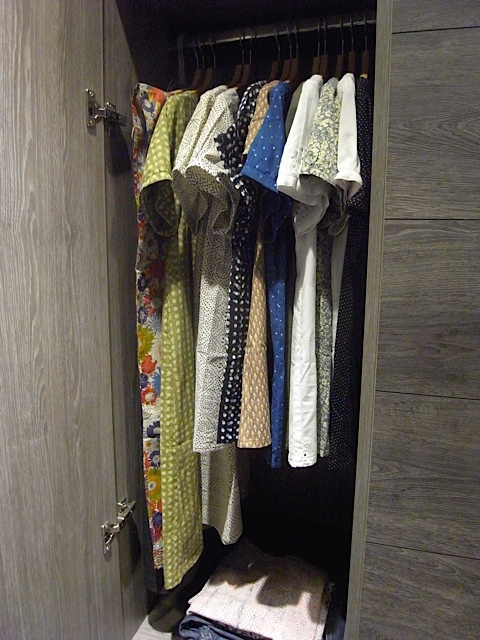 I also took four dresses and a couple of jersey tunics for the traveling. I am a notorious overpacker, can’t help it. I pretty much wore everything, as I changed on two or three evenings before going out. We did an awful lot of walking, which is really the only way to see a city. 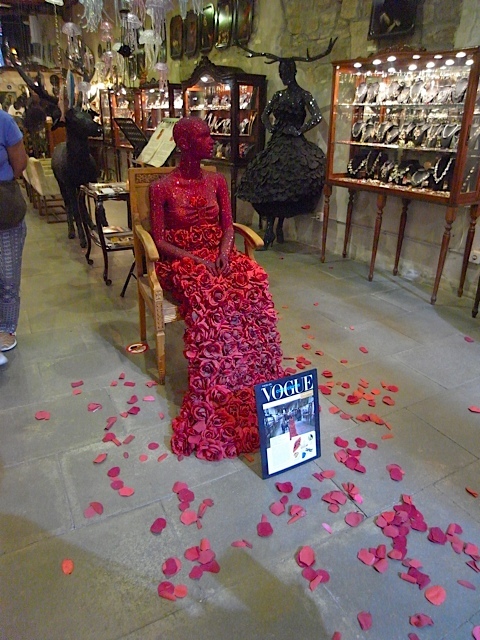 On one of our walks we explored the Gothic quarter and we found some quite interesting shops. 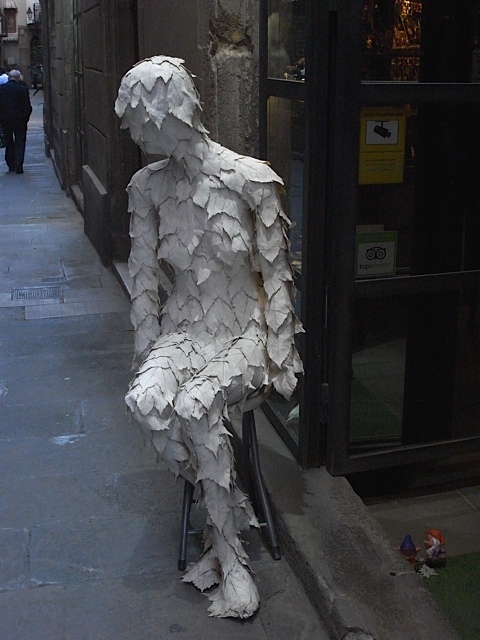 This figure was outside this shop. Its just a little bit creepy! I loved these figures. Interesting shop with lots of unusual jewellery. some of which I think was made on site. Wanted to go back and have another look, but couldn’t find it again. 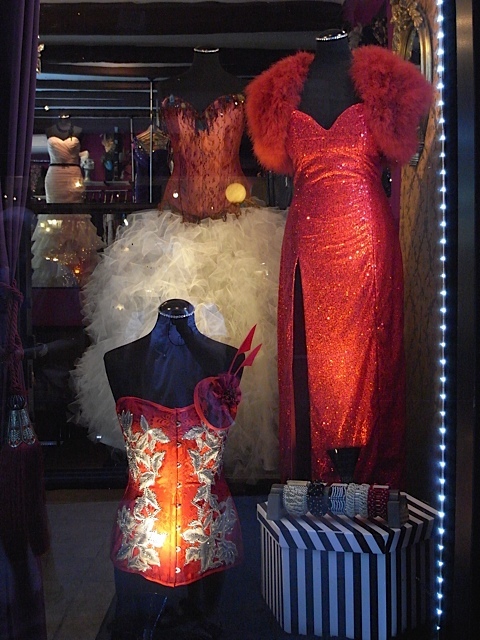 Another gorgeous shop window. Jessica Rabbit springs to mind with that red sequinned dress. Have to be honest here, neither my Husband or I were particularly keen on the Gaudi stuff, the unfinished temple, Segrada Familia is if you ask me a complete eyesore! It is truly grotesque. Sorry Barcelona, I think your favourite son actually went a bit bonkers when he came up with the idea and plans for that place. 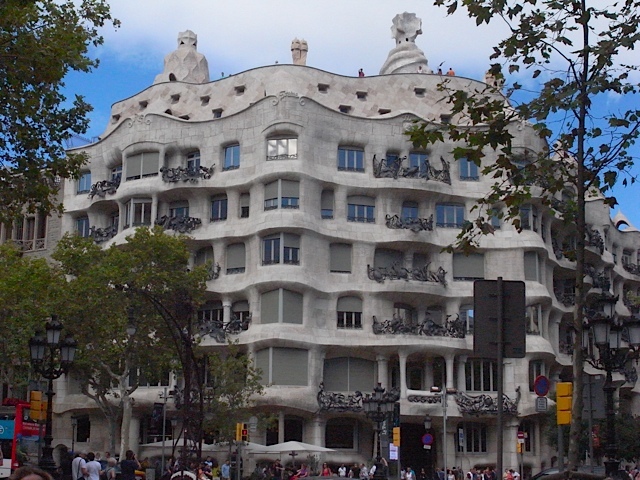 The only place of his we did like was this one Casa Mila, otherwise known as La Pedrera ( the stone quarry). Visited on our second to last day, as thought we ought to see something of Gaudi’s. We also rode Funiculars and Gondolas/Teleferic, or cable cars if you will. 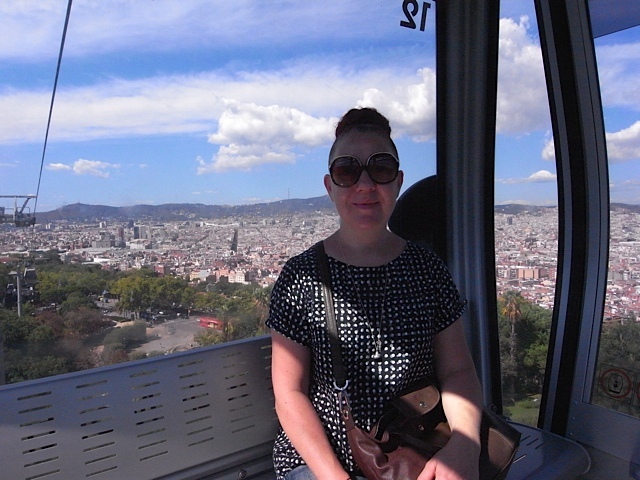 Me in a cable car coming down from Montjuic. Fabulous views over the city. That evening when we came back from our first trip out, the place was buzzing with voices and the sounds of cutlery on plates, bottles being opened and laughter. There were people milling about on the street outside and someone doing a piece to a camera about it. Boy was I intrigued. What was all the fuss? The next evening we were back at the apartment by about 6pm and we had a little rest before going out again, and I was sitting in my favourite place, the little balcony, and from about 6:30pm I watched as a queue formed outside, and by the time they opened at 7pm the area outside the tapas bar was full of people. So my curiosity could take it no more and I asked my husband to google it and we discovered that its a place you HAVE to visit if you are even remotely interested in food. Its called “Quimet & Quimet”. Click on the link to read more about it. The place is tiny though and fills up quickly, it looked a little intimidating and we put off going there till the fourth day, when we managed to get in on the lunch time session. And O.M.G was it worth it or what. I’ve not really experienced proper tapas before and well this has ruined me. It was exquisite, I’m not what you would call a foodie as such, but I do appreciate when flavours and foods work together. It was a truly fabulous experience. 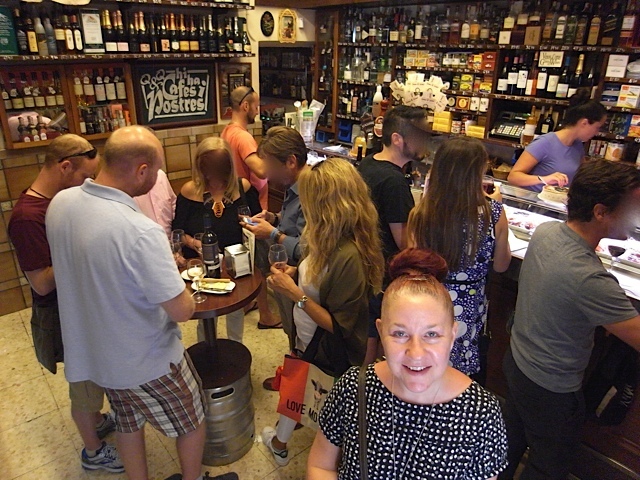 We spoke to an American couple for whom this wasn’t their first time and they said it was legendary and they come every time they visit Barcelona. I still can’t believe how lucky it was that we were staying opposite this place, I don’t think we would have known about it otherwise, its not exactly on a main street. We had three plates of tapas each and then we had three puddings, one each and one to share. This was probably the most expensive meal we had out there but so worth every penny. Me enjoying the ambience inside Quimet & Quimet. This was after they closed the doors at about 4pm, if you’re already inside you can carry on eating and drinking but they let no more in. I promise you when we arrived it was packed and we had to wriggle our way in. Wouldn’t fancy the food bill for him! 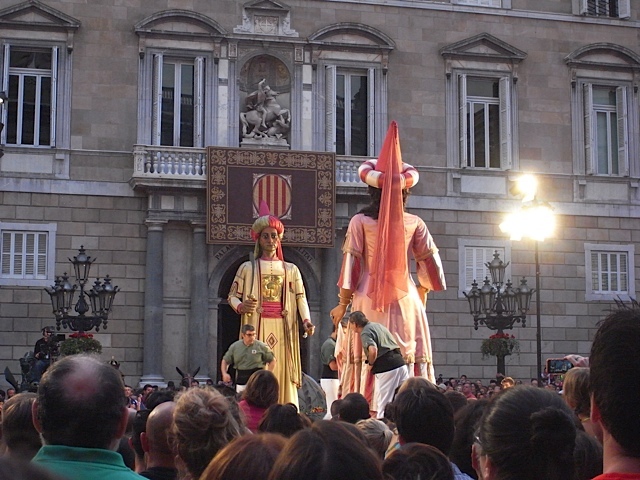 Part of the opening ceremony are these giants. Very impressive. The evening ended with a fabulous firework display on Barceloneta beach. I don’t have any pics of the fireworks, I’d rather watch and enjoy than try and get photos. 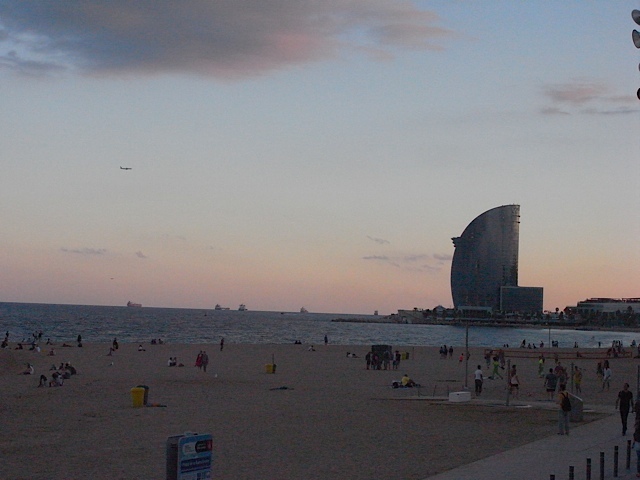 On our last day we took another cable car ride that comes down from Montjuic and takes you to Barceloneta beach. 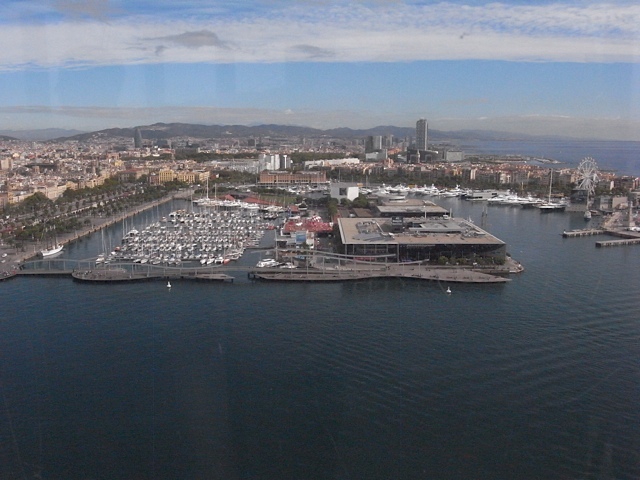 View from the cable car over one of the harbours. Some of the yummiest Sangria I’ve ever had! 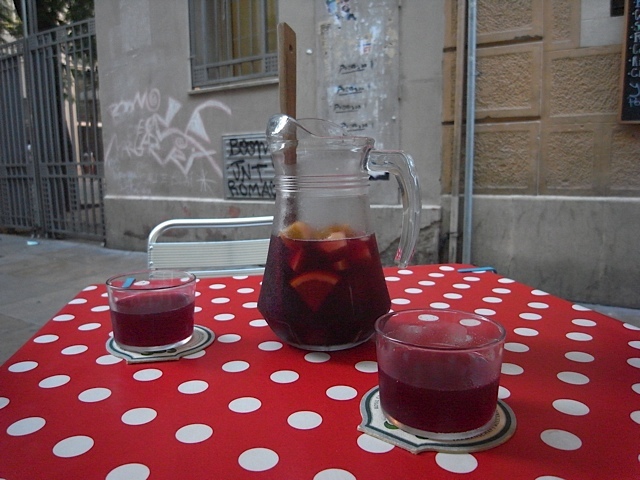 You can’t go to Spain and not have sangria, that would just be rude! 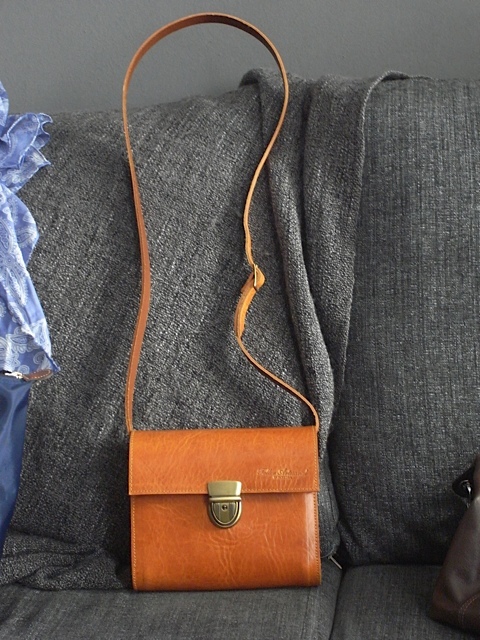 I had to get myself a souvenir, and found this beautiful handmade leather bag. 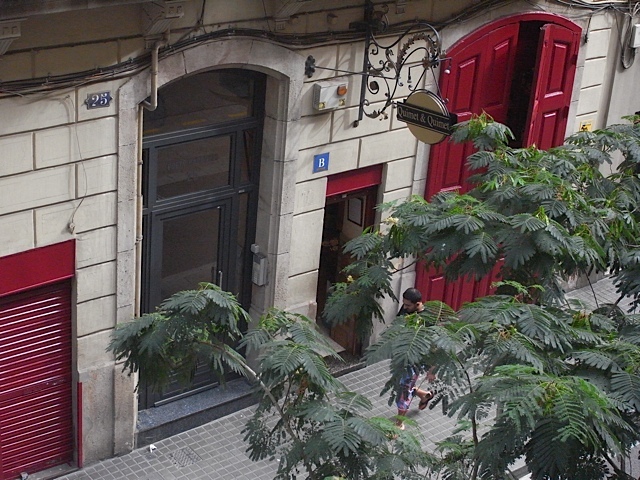 Made in Barcelona, you could see the workshop at the back of the shop. 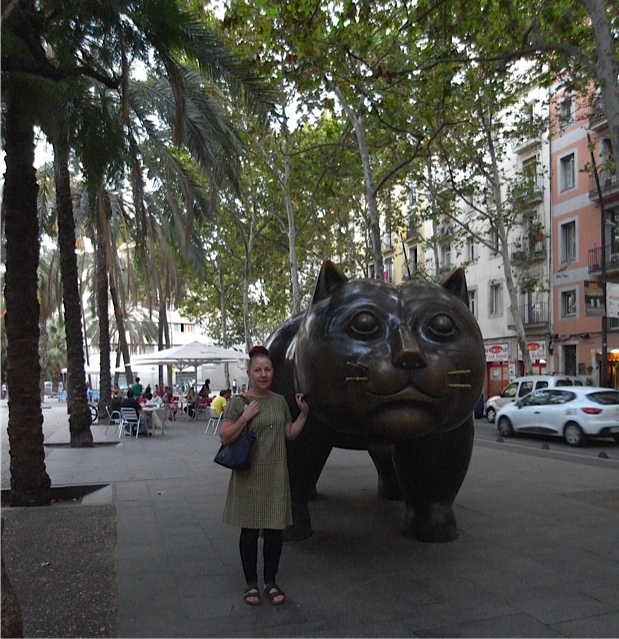 And so that concludes my holiday to Barcelona. I would totally recommend a visit, but take comfortable footwear as you will do a lot of walking.